For further information please contact Eva, telephone 07780 535134, or email the studio. 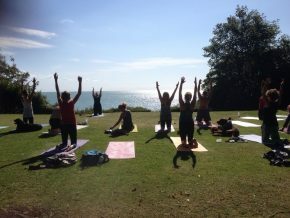 Take advantage of practising yoga outside in the fresh air. Enjoy the amazing views, a beautiful sky, the colourful leaves, beach and the sea.The ground might be uneven, an ant might crawl across your mat, or the sun may be shining in your eyes, but that is what makes outdoor practice so rewarding. You get to go outside your normal routine, feel the earth beneath your feet, and make playful adjustments to your asanas. The music comes courtesy of chirping birds, flowing wind, and the waves lapping up on the beach.Yoga is all about the union of the body and the mind, and when you add the extra element of the outdoors, you can also make it about becoming one with nature.